A nutritious leafy vegetable that will make a delicious light pastry dish. This page contains spinach pie recipes. Roll out half of dough and line 9 inch buttered pie pan. Saute' peppers and ham in oil for 3 minutes. Season with pepper. Whisk 2 eggs and ricotta cheese in large bowl. Spread mixture in pastry shell. Pat spinach dry and sprinkle on top. Sprinkle sauteed mixture over spinach, and top with mozzarella. Add basil. Roll out remaining dough and cover pie. Trim edges. Cut 4 vents and brush top with beaten egg. Bake 50-60 minutes or until golden brown. Let set 20 minutes before serving. To make crust: In large bowl, combine 1 cup flour, Parmesan cheese, undissolved yeast, and salt; stir in water and oil. Stir in enough remaining flour to make soft dough. Kneads on lightly floured surface until smooth and elastic, about 4-6 minutes. Cover; let rest 10 minutes. To make filling: In medium bowl, combine all ingredients; set aside. Preheat oven to 450 degrees F.
To shape: Remove 1/3 dough; reserve. Roll remaining dough to form 12 inch circle; press onto bottom and up side of greased round cake or springform pan. Spoon filling into dough. Roll reserved dough to 9 inch circle; cut into 12 strips. Arrange 6 strips lengthwise and 6 strips crosswise on filling, using longer strips toward center. Using tines of fork, press ends of strips to seal to bottom dough. Place pie in oven; immediately reduce heat to 375 degrees F. Bake 45-50 minutes or until crust is golden brown. Remove from oven; cool on wire rack 10 minutes. Cut into 6 wedges to serve. 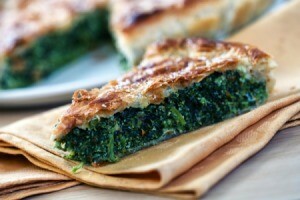 I am looking for the recipe for spinach pies. They look like turnovers. I have only been able to find them in Rhode Island. Preheat oven to 425°F. Lightly grease heavy large baking sheet. Whisk eggs in large bowl to blend. Transfer 1 tablespoon beaten eggs to small bowl and reserve for glaze. Mix spinach, cheese, mint, garlic and pepper into remaining eggs in large bowl. Unfold dough on prepared baking sheet. Gently stretch dough to 11-inch square. Cut dough into 4 equal squares. Spoon 1/4 of spinach filling (about 1/3 cup) into center of each dough square. Fold 1 corner of each square over filling to opposite corner, forming triangle. Press dough edges together tightly with fork to seal. Using sharp knife, cut 3 small slits in top of each turnover to allow steam to escape. Brush tops of turnovers with reserved egg glaze. Bake turnovers until filling is cooked through and tops are golden brown, about 15 minutes. Serve warm. Good luck. I prefer Spanakopita, which uses phyllo dough. I usually just mix chopped spinach, feta (already seasoned with sun-dried tomatoes, etc, from Trader Joe's is a favorite) and olive oil, fold like a flag and bake until golden. 1. Thaw phyllo in package in refrigerator overnight. Melt the butter. 2. Prepare filling of your choice, mixing all ingredients until blended. 3. Unfold phyllo. Keep covered with waxed paper topped with lightly dampened towel while working to prevent drying out. Lightly brush melted butter over 1 sheet. Top with another. Brush again. Cut width wise into 2 inch strips. 4. Place about 1/2 tablespoon filling in bottom corner of each strip. Fold corner over to opposite side, covering filling, to form a triangle. Then fold, flat fashion, lengthwise of strip, following natural pattern of triangle. Trim or tuck in last fold of excess dough. 5. Place seam side down on lightly buttered baking sheet. Brush top with butter. Repeat with remaining dough and filling. 6. Bake at 350 degrees F. for 20-30 minutes or until golden brown. Serve hot. Tips: Use clarified butter for best results. Larger triangles can be made for luncheon meals if you wish. Makes about 5 dozen turnovers.